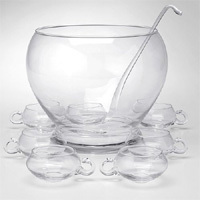 Pour into punch bowl over large block of ice all ingredients except chilled champagne. Stir. Add chilled champagne on top. Decorate with sliced bananas.